Due to traffics everywhere, who would not love to shop at comfort of your own house? What I love about online shopping is the convenience. No more traffic experience while going to the mall. Long queues in the counter and crowded malls. Thanks to the internet, I can check whatever I need and want to buy and shop instantly through online shopping. I can do it whenever or wherever I am and just a click away. I can hold for the meantime and change in case there are items I need to change or let go. Also, it gives me an opportunity to think twice through my purchases. I usually add all the stuffs that I like to my shopping cart and then I check each item again before paying then if I decided not to take the item or I don’t need it that much, I just hit delete/cancel order. Just like malls who go on sale, in online shopping, I can score for deals as well. Yes, most of the time there are a lot of deals, discounts and promo codes. ShopBack is my favorite, I get to shop and earn at the same time, for some food and groceries, Takatack vouchers are available. Since I love to travel, most of the time I am checking out the available flights with Qatar Airways promos and Hotels.com promotions. There are so many travel merchants that you can actually check-out. I also check out my email regularly to monitor deals so that in case I have something to buy I can easily check deals. 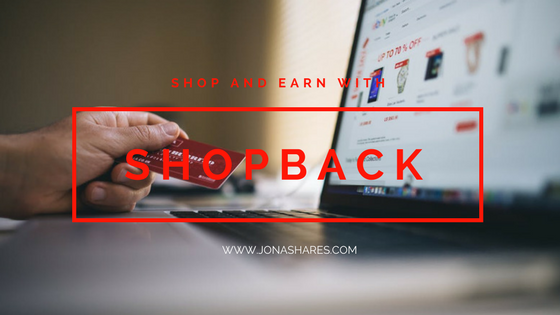 And to let you learn more about about how ShopBack works, you can watch the video. So what are you waiting for? Tell your family, colleagues, neighbors and your travel friends about the good news. Feel free to share this information. Click here to register for free. I am always looking for ways to save money shopping. I will have to give ShopBack a try. I save up my rewards points and buy Christmas gifts with them. I had not heard of Shopback before reading your post. However, I am all about saving as much money as possible! Online shopping is the best thing in this generation, it gives you the ease to get what you want while just sitting on your couch but at the same time you need to be a bit more cautious with the purchases you make. Wow - thank you so much for introducing me to Shop Back. Before your post I'd never heard about this before. Sounds like an excellent money-saving deal all the way around! was bit confused earlier how this cashback concept works, it cleared the confusion. thanks a lot. I've never heard of this site. Then again I use amazon and the only real stores I shop at are Hot Topic and Best Buy xD Gonna have to check it out :) Might be good for those days when I wanna spend money but don't wanna deal with other human beings. I have a lot of saving apps, but I have never heard of shopback! I really need to look into this! What a great way to earn while shopping online! I'll be honest, I love discounts, deals and promos. I will check this and try. ShopBack sounds like it could become a love of mine, haha. I LOVE shopping online! So handy! Wow, I love websites that are into deals and coupons. I love that you gotta earn cash backs here. I don't really use cash back apps much. I have one with pinch but I don't find I get much out of them. Shopback sounds like a good concept shop and get cash back - great ! who wouldn't love that. Will check it out sometime. i shop online more and more these days and am always looking for discounts and savings so of course i'm signing up to this. Oh wow never heard of Shopback before but sounds intriguing. I currently use Ebates for my cashback but will definitely be checking them out. Oh! More incentive to just BUY MORE STUFF! lol!